Mocean LBS is a flexible platform that allows Mobile Operators to launch location based services. The system supports both Push and Pull based services. Push based services mechanism works in the manner where services will be triggered automatically to Mobile Subscribers on the basis of their current location. Typically Mobile Subscribers would have opted-in for such services. Examples of such services are Targeted Advertising and Public Message Notification. Such services would require Mocean LBS to monitor in real time the subscriber location. Mocean LBS has its own SS7 Monitoring component or it can work with external SS7 probes to achieve this. Pull based services mechanism works in the manner where a particular Mobile Subscriber would be required to request for the LBS service. 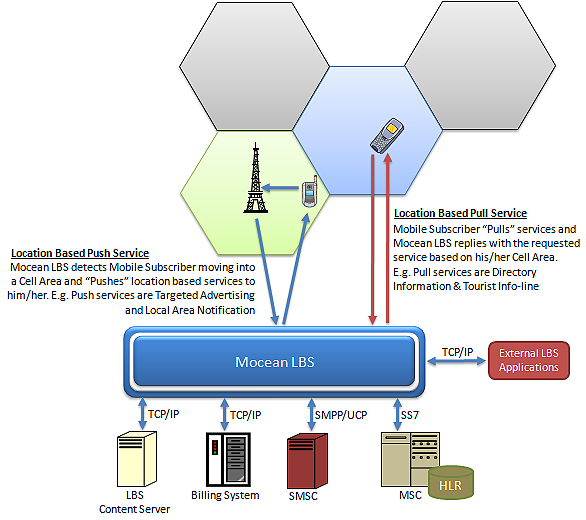 Mocean LBS will then based on the Mobile Subscriber’s current location provide the required information accordingly. Examples of such services are Directory Information (e.g. closest hospital, petrol station and eateries) and Tourist Info-line (e.g. place of interest, audio-visual location clips and closest hotel). Mocean LBS will query the Mobile Network to identify the current location of the Mobile Subscriber. For services that identified the location of a particular subscriber to another party (for example Family Finder), the system has Subscriber Privacy feature that requires the particular subscriber to provide permission for such queries. Subscribers can also at any time rescind the permission, enabling the subscriber to have full control of what information to be given out. This feature can also be turned off for certain services for example Logistic Tracking where the person being tracked is obligated to be tracked for valid reasons. Mocean LBS also has the capability to integrate to external Content Server to retrieve services information. It can also optionally provide external application interface via TCP. This will provide Mobile Operator the flexibility to have multiple Location Based Service Providers, providing more services to its subscribers. Mocean LBS takes into consideration all this requirements, allowing Mobile Operators the capability to launch and start providing innovative services to its subscribers.